"The children of Afghanistan were allowed to carry a Kalashnikov but not homework." Published in 2002, this book is a pretty bleak look at Afghanistan, mostly the last decade or so pre-9/11, though there is a little of it (9/11) at the very end. 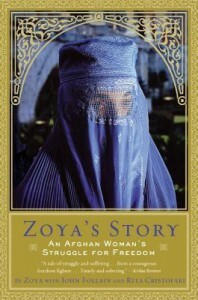 It chronicles the experiences of Zoya, an Afghani activist from a very young age working to improve the lives of women in her country. I would be interested to learn any updates on Zoya's story, how things might have changed for her and those she knows, her country. Not a happy book, but perhaps a necessary one; having read a number of Middle Eastern women's memoirs (after latching onto the subject during college when I was fortunate to take a Middle Eastern women's studies class), I have to say those set in Afghanistan seem to be among the most desolate.